This isn’t happening in Alabama, as its history offered is forthright and exhibited everywhere. This place is full of United States history. In the same way we admire courage in signing the Declaration of Independence, the story in Alabama comes out of similar display of courage and convictions. The parts about what to see on tour, to avoid sugar coating it, are mostly vestiges of murders, Ku Klux Klan (KKK), Civil War, Jim Crow, protests, and transition into a tolerant community. In the end, probably the people here got tired of all the fighting. Reoccupation by federal troops, investigations by FBI men, and more, also helped make a consensus decision to move on with the rest of the world. The story does have a happy ending. Montgomery and Birmingham are today’s cities on an upward move; unique restaurants in revitalized commercial districts and family activity fun. Leaders of communities are dealing positively with history that, for a time, went from bad to worse. 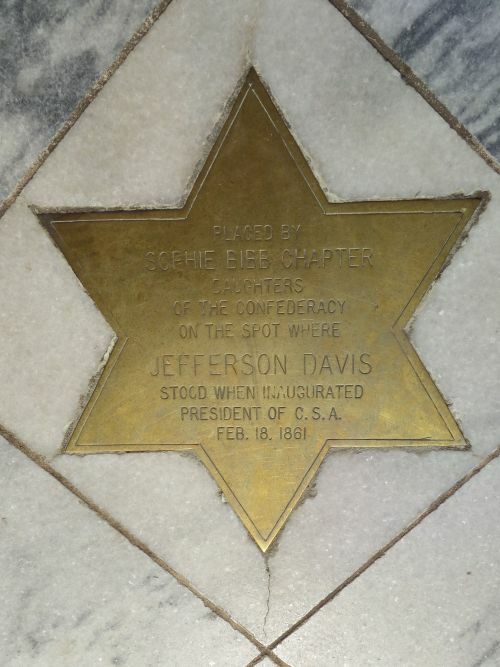 Montgomery state capitol steps, where Jefferson Davis took the oath for President of the Confederate States of America. The first White House of the Confederacy, before government moved to Richmond, VA.
Bank building where the Confederacy was initially financed. Telegraph building, where delegates to the Confederate government sent the order to fire on Ft. Sumter, starting the Civil War. Slave auction area at Dexter and Commerce Streets. Plantation properties still exist in the area. Bus stop at Dexter and Commerce Streets, where Rosa Parks boarded the bus and refused to give up her seat to whites boarding after her. Rosa Parks Museum at the spot where the arrest happened. Baptist Church on Dexter Avenue, where Dr. King was the pastor and leaders of the 1955 Montgomery Bus Boycott organized. Greyhound Bus Station, where freedom marchers arrived for the march on the state capitol building. At least one march participant, a woman from Michigan, on her way home was murdered by members of the KKK. Alabama history, displayed in Voices at the Alabama Archives Museum. Renaissance Montgomery Hotel & Spa at the Convention Center is a great place to stay and walk to both downtown history and the riverfront. Renaissance Executive Chef John Melton knows his Southern fare and recommended are the fowl dishes. City view from Red mountain, the highest point in the area. See the Vulcan colossal statue displayed at the St. Louis World’s Fair of 1904, and Birmingham industrial history in the museum there. Visit the 16th Street Baptist Church, where a brutal bombing in 1963 killed four girls preparing for the worship services. Take the Civil Rights District walk, where “Bull” Connor led public safety city workers in violent opposition to the nonviolent civil rights protests. Experience in the park across from the 16th Street Baptist Church a series of story stations, depicting the four murdered girls, water cannons used on the marchers, vicious dogs attacking, and more. Escape it all for a day of motorsports history at the Barber Vintage Motorsports Museum, where visitors see 1,400 motorcycles and formula race cars. Montgomery is the capitol of Alabama and, in 1861, was the first capital of the Confederate States of America. From 1961 to 1993, the capitol building flew the “Stars and Bars,” the first official flag of the Confederacy, in remembrance of the Civil War’s 100th anniversary. The Stars and Bars was actually close to the United States flag in appearance (hence, the flag changed in 1863), and today is confused with the better known Southern Cross design of the Confederate Battle Flag. 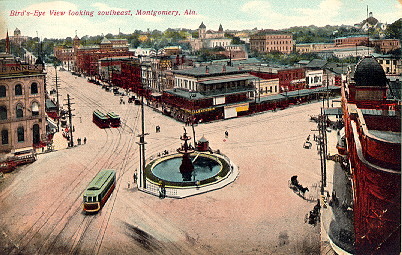 Montgomery was where secessionists actually launched the U.S. Civil War in 1861 and, much later in 1955, a defiant woman on a city bus raised issues leading to the demise of Jim Crow throughout the United States. It is also where, in 1965, Martin Luther King led a nonviolent march from Selma to the capitol steps in Montgomery to demand voting rights. Dichotomy is the only word to describe this all happening in one place. On the left in the distance, note the capitol dome at the end of Dexter Avenue. President Jefferson Davis, Confederate States of America, paraded up Dexter Avenue from the Court Square and stood on the capitol steps for the oath of office. To the right of the capitol dome (under the word ‘looking’) is the spire of Dexter Avenue Baptist Church, where Martin Luther King was once its pastor. From the round fountain, look to the left side, this is where Rosa Parks boarded her bus in 1955. The building above this future bus stop is the Central Bank Building. The bank vigorously supported financial needs of the Confederate Government in 1861, only to end in bankruptcy by 1865. Directly above the fountain is the Winter building, housing the telegraph office in 1861. From here, that the Confederate Government sent the order for firing on Fort Sumpter at Charleston, South Carolina. This is why it is said that the Civil War began in Montgomery, Alabama. 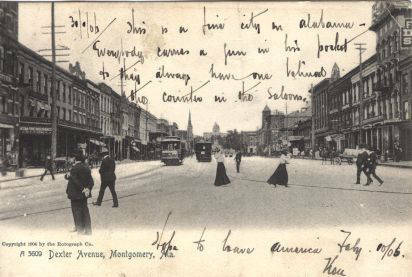 Dexter Avenue Church steeple is seen in this postcard photo of Montgomery, looking up Dexter Avenue, and the state capitol building in the distance. 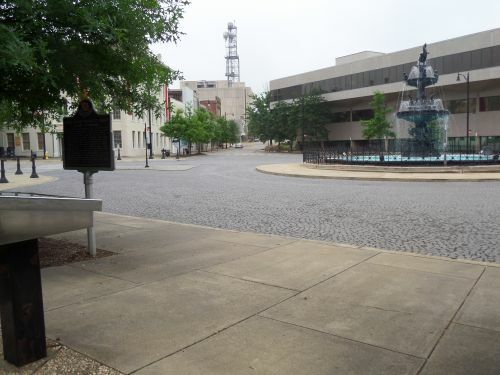 Court Square view in 2014, looking from the bus stop where Rosa Parks boarded the city bus. Central Bank Building is on the left, out of view. Behind the trees to the left is the Winter Building; the telegraph office in 1861. Jefferson Davis stood on the state capitol steps, taking his oath of office as President of the Confederate States of America. He spoke in his inaugural address of regional divisions and encouraging the raising of an army. Governor George Wallace stood on the same steps in 1963 for his inauguration speech and said to the assembled crowd, “Segregation now, segregation tomorrow, segregation forever”. Intriguing, emotional, and educational is the Rosa Parks Library and Museum, Montgomery. Its purpose is to educate and inform, and after leaving, one wants to understand more about the bus-boycott and people risking beatings or bombs. Reading and learning about the civil rights movement in the 1950s and 1960s, the pattern of the struggle emerges. The story of Rosa Parks is one apex in a sawtooth of organized confrontations against segregation. Reviewing some of the history, it is apparent that leaders and organizers may not have known at the time the relative importance of each event, but events were organized for a purposeful outcome. It was a well-planned campaign, fought in many areas, that was implemented by a series of civil rights organizers going back to Frederick Douglass in the Civil War era. Rosa Parks was not the first to challenge local segregation ordinances. The law challenged by Rosa Parks required blacks to give up their bus seat if a white passenger boarded a full bus. About 9 months earlier than Rosa Parks, a teenage girl refused moving seats when the bus was full. The girl, Claudette Colvin, also was arrested and was a named participant in later court actions that overturned the bus segregation laws in Alabama. Rosa Parks, being an adult activist, made a better test case to challenge bus segregation. Eleven years earlier than Rosa Parks, Jackie Robinson was court-martialed by the US Army for refusing to comply with Fort Hood, Texas, area racial servility. He refused to move his seat to the back of a bus. As an Army Second Lieutenant, he was subjected to a protracted series of actions that culminated in his discharge from active service on a medical related technicality. Simply put, a means was found to eliminate the problem situation. It is important to know that other popular legends, such as champion boxer Joe Louis, were aware of 2nd Lt. Robinson, even before his commissioning. Jackie Robinson was a UCLA football star who achieved notoriety, but he became famous for crossing the color line to join the Brooklyn Dodgers baseball team in 1947. The history of the earlier court martial of Jackie Robinson can be read here. Bus ridership rules at Fort Hood, and inability of the military judicial system to enforce them, must have been known to the 1955 civil rights organizers in Montgomery. The African-American community rallied behind Rosa Parks and answered calls to boycott the bus system. This call for a boycott had precedence from 1906 events, and was probably planned out as the next action. Segregation on street cars, well before invention of motorized bus-type vehicles, began the back of the bus rules that eventually prompted area blacks to protest the rules in 1955. 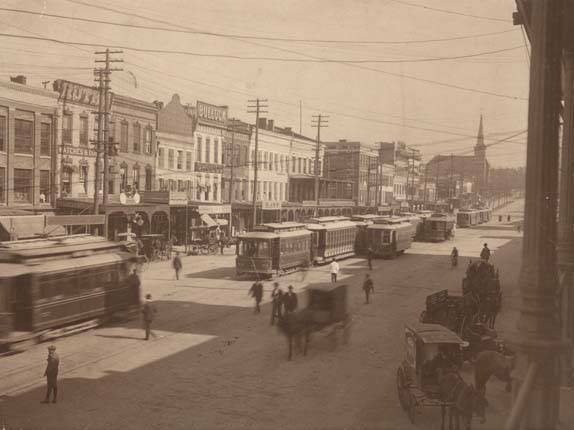 In 1906, the Montgomery City Council passed an ordinance requiring blacks and whites to ride on separate streetcars. The private owner of these streetcars refused to comply because he would lose money. In protest, all the streetcars were locked down and car operators were arrested. Eventually, the city changed its ordinance so that African-Americans would ride in the back of the cars. Segregation in other areas still existed after the 1955 court action to take bus transportation off the list of Jim Crow ordinances. In a methodical, step-by-step series of actions throughout the next ten years, civil rights activists destroyed segregation. Today, one can pick and choose by personal interest what to see in Birmingham. On the one hand, tourism and education about the civil rights struggle is paramount. How can this ever be secondary to this community? Then there is the excellent Birmingham Museum of Art , and a museum devoted to local economic history. In Birmingham, visit the Birmingham Civil Rights Institute, across the street from the 16th Street Baptist Church. In 1963, four young girls died from a bomb planted there by KKK segregationists. These are only highlights and the history is much longer and horrific than can be presented here. Suffice to say that Birmingham was known as “Bombingham,” due to persistent bombings by segregationists between 1945 and the early 1960’s. It was widely considered to be the most segregated area in the Deep South. During 1963 demonstrations led by Martin Luther King, jails were so full that a simple inmate breakfast service took over four hours. Eugene “Bull” Connor, as Commissioner of Public Safety, became famous for turning fire department hoses and police dogs on demonstrators. He kept it up until even all-white civic workers began refusing to obey. The warring in Birmingham dominated world news. An excellent synopsis of these painful events can be found here. But among the photos, statutes, and stories are fun places to visit and enjoy family time. Dinner at an excellent seafood restaurant, Dixie Fish Co., includes live music on an outdoor deck. Soul food at Eagles Restaurant is varied and popular (get cornbread, it is great). Birmingham redevelopment includes a new complex, with shopping, coffee, and dining. This is the Uptown District and a good stop is The Southern Kitchen & Bar Birmingham’s Uptown District . Jones Valley Teaching Farm is open for visitors and sells fresh produce grown by local children. 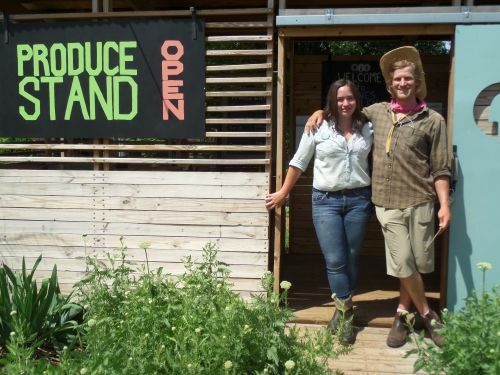 Teaching young people in the city about farming encourages healthy diets. Walk around the garden and questions are encouraged by staff. Lodging in downtown Birmingham is pleasant at Hampton Inn. It is located across the street from an excellent public library with archives of the Civil War. Extensive collections of genealogically relevant material are available, including the Southern history collection. 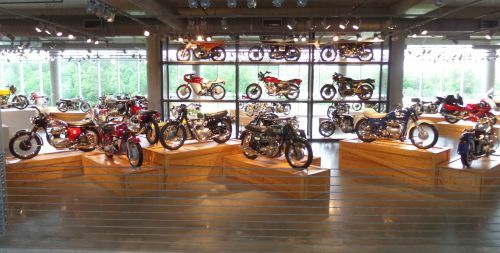 Barber Vintage Motorsports Museum, with 1,400 exhibits, is perhaps the best motor vehicle museum ever built and focuses on motorcycles. There are also formula race cars from several eras that show technology growth. History has many different stories and uses by generations. The time of segregation in Alabama has passed, and the KKK has waned. The popular 1979-1985 television show, Dukes of Hazzard, featured a orange race car named “General Lee,” with a Confederate battle flag on its roof. Since then, plastic models of the car no longer have a flag and reruns of the series are considered offensive by some. Riding around Alabama, the flag is not a common sight as it once was. Change is not over, however, as I witnessed a wedding bouquet and ring set arranged around the Jefferson Davis bronze star on the capitol steps for photographs. This spot represents many different things to many people. After explaining it away, one thought returns – Who would want such a photograph in a wedding album? The Dukes of Hazzard and cousin Daisy, perhaps. Allan Kissam has experiences that give him insights when writing that may not be obvious to most people. His first job after college was a deputy in the uncuff and search cage of the Orange County Sheriff...at times it was cage fighting. Turning in the badge he headed to six years at sea managing nautical charting surveys and environmental studies. Often this involved scuba diving for recovery of instruments or checking navigation hazards. Today, Allan specializes in information systems security as a Certified Information Systems Security Professional (CISSP) and a Certified Ethical Hacker (C|EH). He has published in technical journals and is awarded two U.S. patents. Focused on travel writing, his publications have been selected as the Feature Article by editors of travel online blogs. These publications include print magazines for aircraft owners, or for engineering readership. Allan continues searching out the interesting aspects and unusual perspective of travel destinations that cause people to take note. He is a member of the International Food, Wine, and Travel Writers Association (IFWTWA).